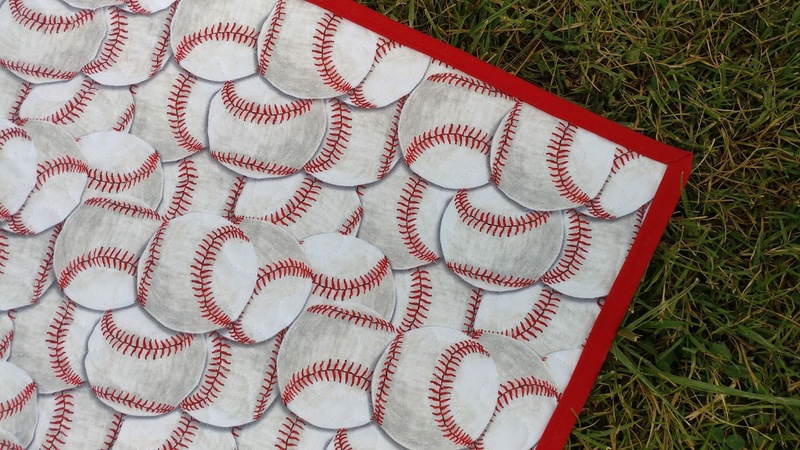 Slice of Pi Quilts: Play Ball! 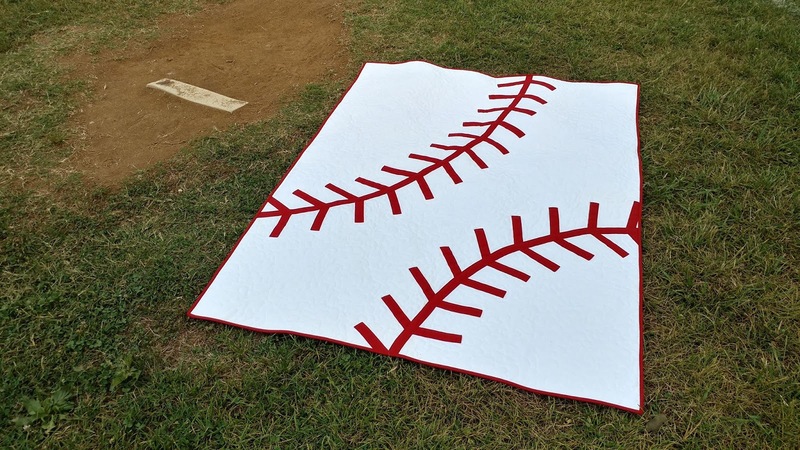 A quick Pinterest search for "baseball quilt" resulted in several striking quilts. 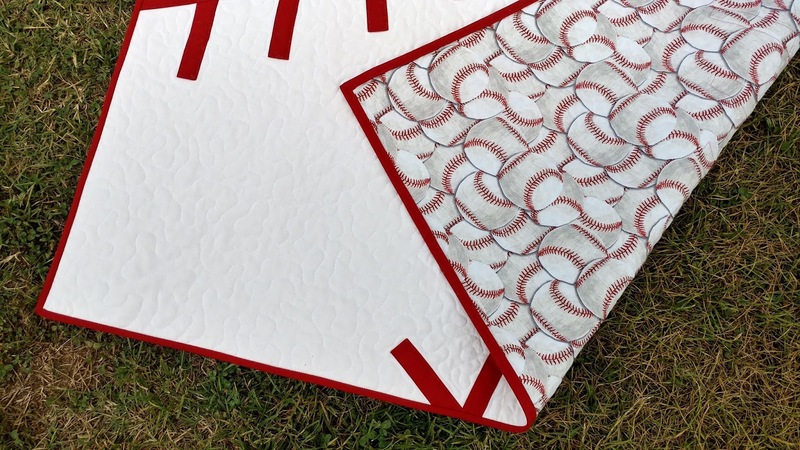 I fell in love with the ones with a solid white background and large red baseball stitches. 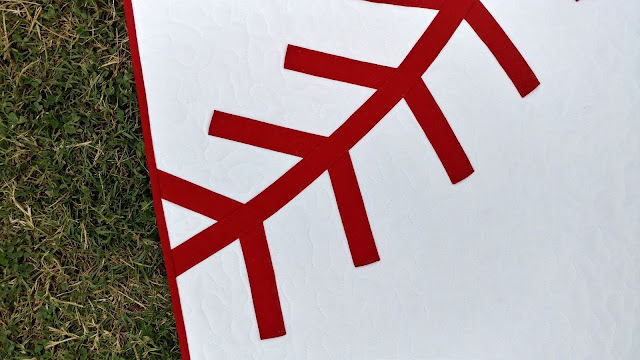 There is a pattern on Craftsy for a baseball quilt using raw edge applique that I strongly considered. However, I decided raw edge applique wasn't what I wanted for this quilt. So I set out on my own. 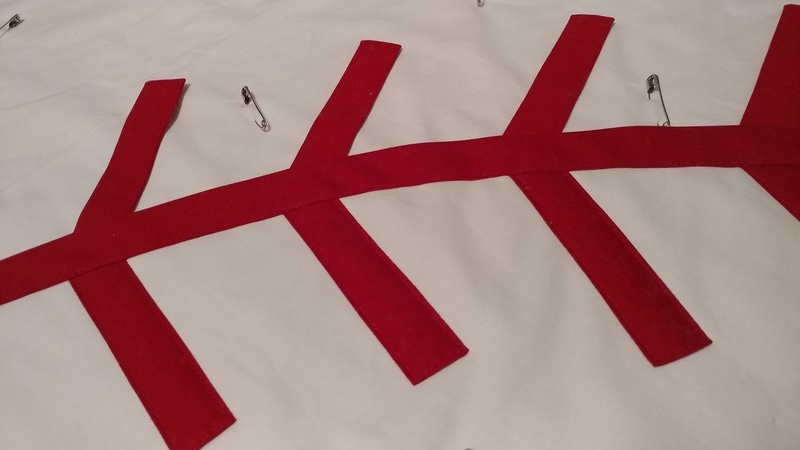 I decided to make a throw quilt and use the width of the fabric (about 42") as the width of the quilt and about 1 1/2 yards for the length (54"). 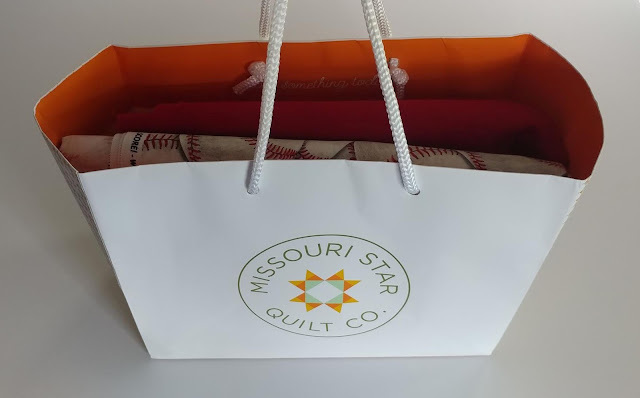 I planned to use some of the solid white Moda Bella 98 fabric that I keep on hand by the bolt, then picked up some Kona Chinese Red and a baseball print called "Hit, Run, Score" by Blank Quilting from the MO Star Quilt Co. when I visited earlier this month. 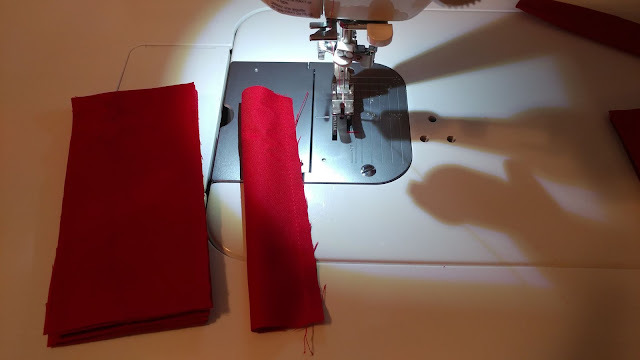 I started by cutting two 2" wide bias strips from the red fabric. Then I pressed them into 1" bias tape using a bias tape maker. 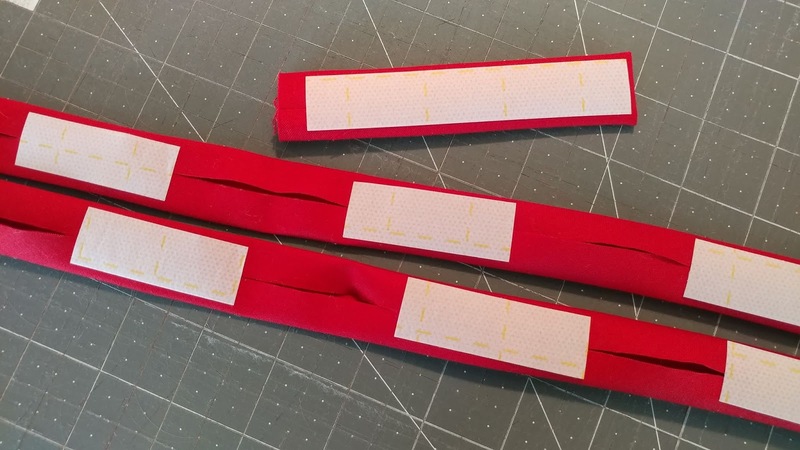 Next I cut about forty 2 1/2" x 5" strips of red for the laces. I first sewed them into tubes, then centered the seam, finger pressed the seam open, and stitched the end closed. After pressing each "lace," I turned the tubes right side out then pressed them again. 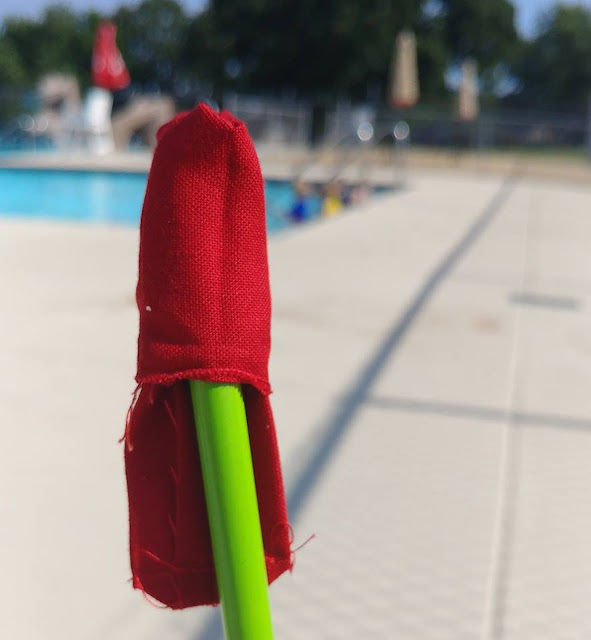 This was a great activity to do during swimming lessons! To place the laces onto the white background fabric, I put strips of Lite Steam-A-Seam 2 onto the backs of each piece. I love this fusible because it's sticky before pressing, so I can move and rearrange pieces on my design wall until I'm satisfied with the whole layout. I first guessed at the spacing, but decided quickly I couldn't be consistent enough for my liking. I cut a template from paper so that the spacing and angle of each lace would be more precise (with just a small bit of adjusting depending on whether the lace was on the inside curve or outside curve). I placed each lace under the main bias tape strip, hiding the one end with raw edges. Once I was happy with the layout, I pressed the laces to secure them to the quilt top. 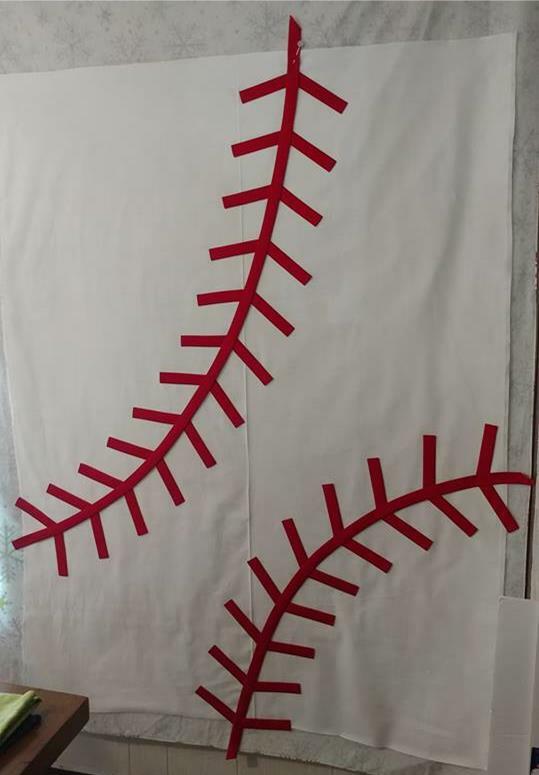 I pin basted the quilt sandwich on my dining room table using the baseball print fabric for the backing and Warm & Natural batting. 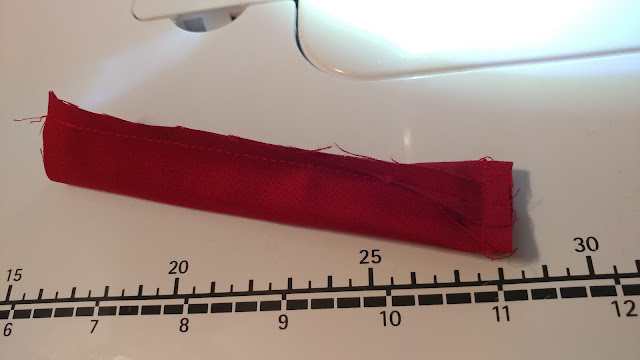 I used my walking foot and 50wt Aurifil Red #2250 to stitch just inside the edge of each piece. Once the laces were stitched down, I switched to 50wt Aurifil White #2024 and my free motion foot. I quilted a small meander design over all of the white space. 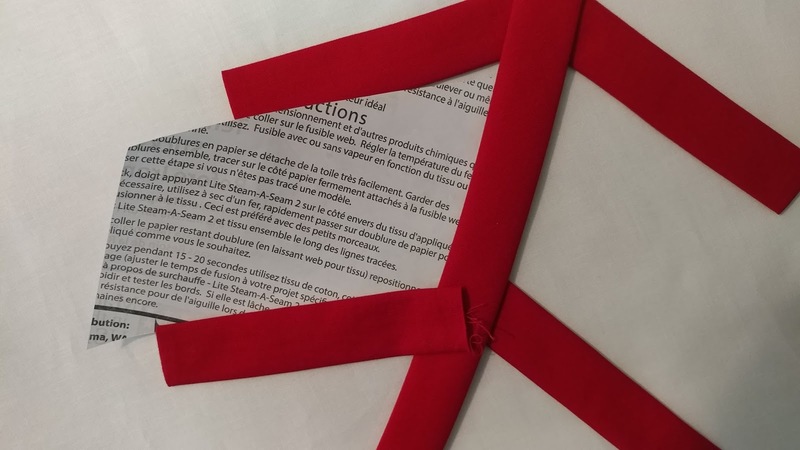 The binding is machine stitched on using the same Kona Chinese Red. 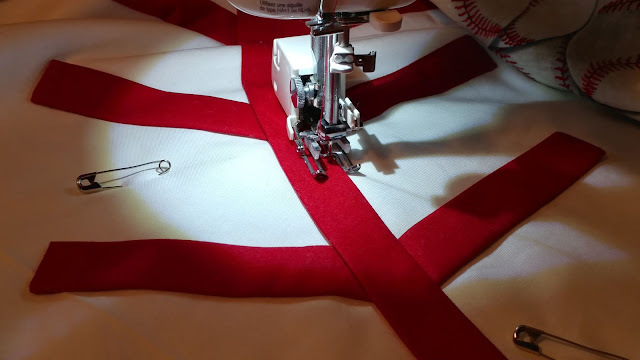 I wondered if the red fabric would bleed any onto the white, so decided it was better I find out than the recipient. I tossed it in the washing machine with two Color Catchers, and there wasn't any bleeding! I tumble dried the quilt and it came out with the loveliest crinkle! 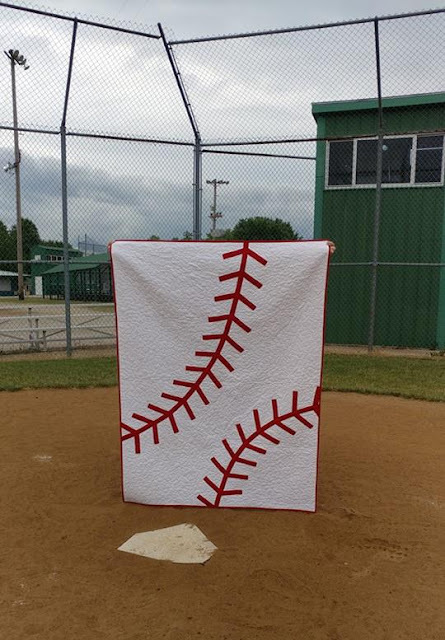 Monday night was the last t-ball game, so we gifted the quilt after the game. She was surprised and very appreciative! 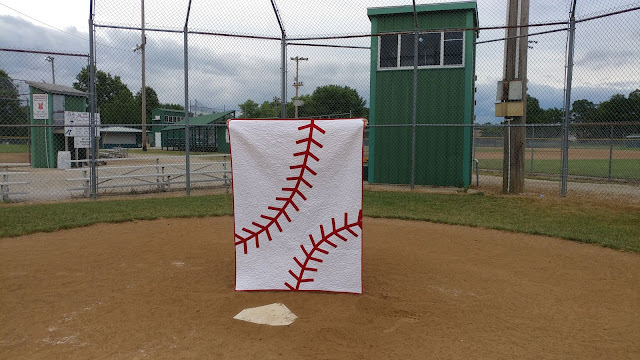 I'm sure the quilt will get lots of use with her three baseball-loving boys! Thank you, Coach! You will truly be impossible to forget! Linking up with Main Crush Monday at Cooking Up Quilts, Monday Making at Love Laugh Quilt, Let's Bee Social at Sew Fresh Quilts, Wednesday Wait Loss at The Inquiring Quilter, Midweek Makers at Quilt Fabrication, Needle & Thread Thursday at My Quilt Infatuation, Can I Get a Whoop Whoop at Confessions of a Fabric Addict, TGIFF at Musings of a Menopausal Melon, and Friday Foto Fun at Powered by Quilting. Truly fantastic story, and a gorgeous quilt! This is such an awesome gift to give to a baseball coach. I love your creativity. That was so sweet of you, I am sure she appreciated it. Truly a fun quilt. Hi Laura! I just adore this quilt!! So very, very cool and the backing is just beyond perfect. I am 100% sure she will enjoy this for years to come and think of you and your thoughtfulness. Boy, I don't know how she has time for everything she gets done!! LOVE the quilt!! and like the backing so much that I clicked on the link and ordered 10 yds to use as backing for a couple of my husband's t-shirt quilts that I will be making for our grandkids. That's amazing. It sounds like you really lucked out with a one-of-a-kind coach. I love the quilt you made for her! Making all of those tubs probably took a lot longer than raw edge, but the quilt will hold up so well when all of her boys are dragging it around. That was super clever to tuck the raw ends of the tubs under the bias tape. Thank you for sharing! Great design, Laura! What a blessing your children's coach has been. Best gift I know to give, too! This is a great quilt! 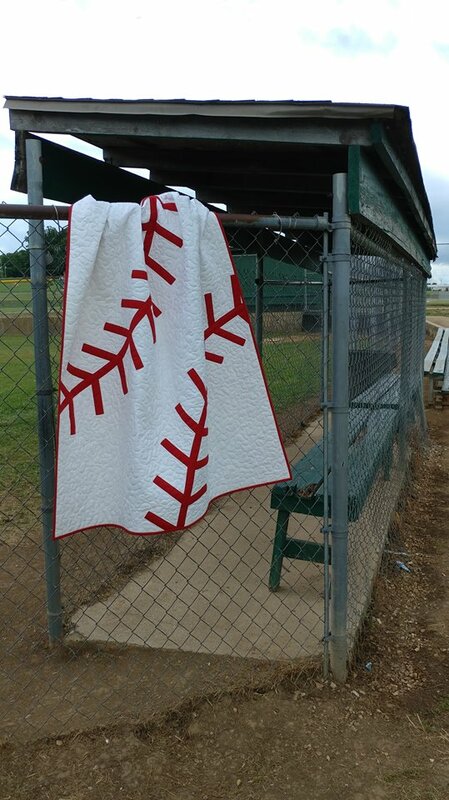 I want one for when I go to the home openers in chilly April each year! Beautiful quilt for a truly remarkable coach!!! A great idea and a beautiful quilt! Gorgeous quilt. Wonderful gesture. Super cool. This is the best! 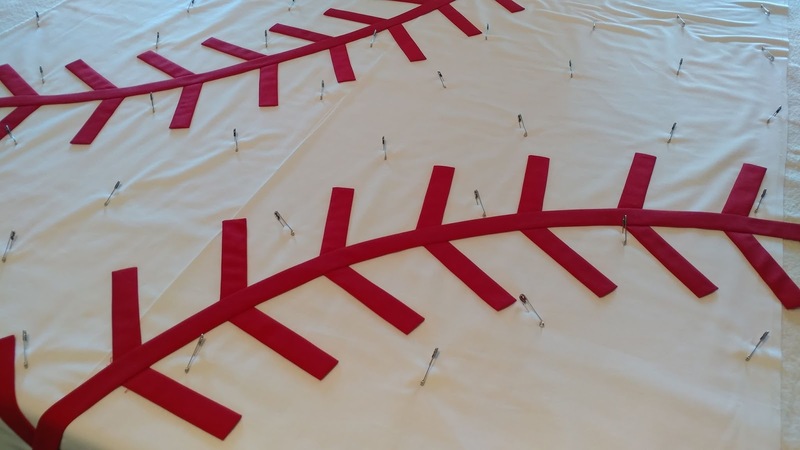 You hit a home run with the design and your ingenuity! Lovely, striking design! Your photos show exactly how to make one if someone wanted to. I'm so glad it didn't bleed. Coach looks so happy to have received it and I'm sure it will get a lot of use! Thank you for sharing this on Wednesday Wait Loss, it's lovely! Perfect quilt for a perfect coach. Great story. Great quilt design. You've outdone yourself...again! 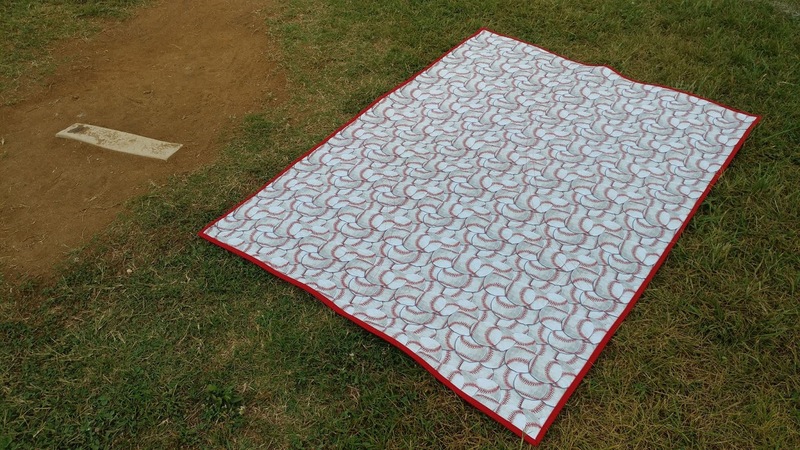 That is the perfect thank you quilt for her!! And great backing too! Wow, this is absolutely amazing! Seriously, one of my most favorite things I've seen, ever. I totally want to make this now. I don't have words. 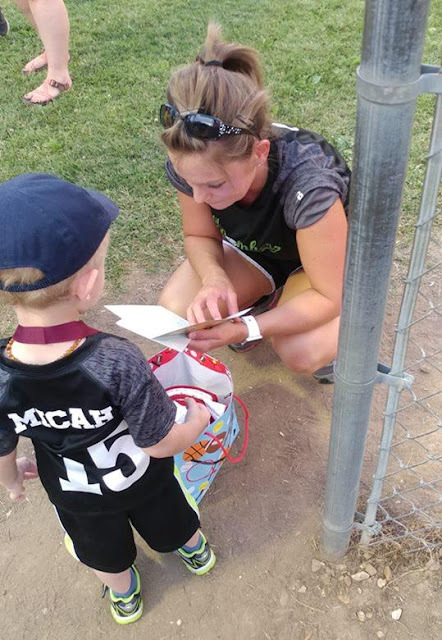 You had an awesome coach and she had an awesome, appreciative parent. WTG! Wow -- on so many levels! 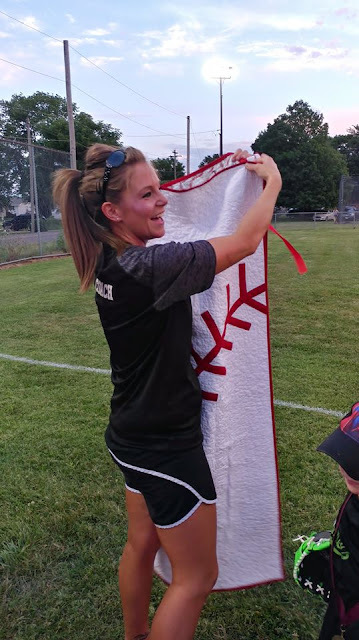 How kind and super creative of you to gift this quilt to your super coach. She'll treasure it for years... You did a great job coming up with your own pattern. Brilliant.... etc. etc. Kudos to you! Delightful quilt! Great volunteers are wonderful! Incredibly thoughtful gift.....and gorgeous! LOVE IT!!! What a fun quilt Laura and so creative! Thanks for sharing!